What is lucky? Winning lotto, a happy coincidence, an unexpected opportunity, a chance encounter. Whatever spin you put on it, my mother Annemarie had a very fortunate chance encounter. 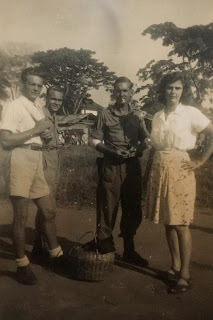 Annemarie and Gretel had survived the Japanese prisoner of war camp Banjoe Biroe on Java, Dutch East Indies, but their mother had not and after Japan's official surrender on August 15, 1945, they had found their father with the aid of the International Red Cross. They were now living with their father in Bandung in the old army barracks in an officer's bungalow. Life seemed to be getting back to normal, although there was unrest and fighting around them from the rebels agitating for independance from the Netherlands. But they were starting to enjoy life again - there were even dances and entertainment on the weekends. What female in your family tree has shown remarkable strength (either physical or emotional)? That is the question for the week 10 prompt and who would fit the bill in my line-up of ancestors. A few come to mind and I have already dedicated a blog to my German born grandmother Meta, who ran a soup kitchen from her home in Japan occupied Java, before being taken into camp with her two daughters, - metawrites.blogspot.com.au. For now I want to turn the spotlight on my great-great grandmother Anna Hendrika Knoops, who I've gotten to know a little through the letters I have from her husband and finally a portrait scan I received from my cousin. Where there's a will, there's a .... fill in the blanks is the prompt for week 9. It could be an actual document like a last will and testament. 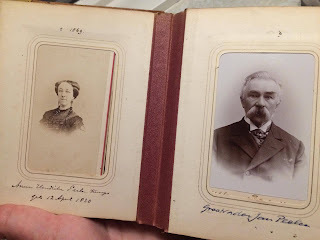 In my family research so far I have not found one and I was relieved to receive this very timely blog post from Dutch genealogist Yvette Hoitink, Dutch Ancestors left few last wills. So I'm going with "where there's a will, there's a way". My Dutch grandmother Bé Blomberg-Lawerman liked to say "wil niet is dood en kan niet ligt ernaast" - "will not is dead and cannot lies beside it". Off I'd go again, grumbling, to do my homework; she wasn't buying my latest excuse. So now I'm delving into the memories of family stories that tell of determination and ingenuity in the face of adversity.